You’ve evaluated the benefits of solar power, and you’re ready to buy solar panels for your home. But do you pay for professional installation or go the DIY route and install the system yourself? Before you make a decision, consider the pros and cons of each. Many people don’t realize that they can install their own solar panel system. This installation method isn’t without its challenges, but it has some sizeable payoffs. First, let’s look at the pros of DIY solar installation. Lower Costs: Solar kits are less expensive than hiring a solar power company, as you don’t have to pay for a professional to install your system. It can cost between $3 and $4 per watt to have solar panels professionally installed,1 meaning a 5 kilowatt (kW) system could cost between $11,200 to $14,400 before incentives. By installing a system yourself, you won’t have to deal with installation expenses, meaning you could bring pricing down to the $2-per-watt base cost. Those savings could bring the overall total to just $10,500—or less, depending on panel make and quality—for a 5 kW system. 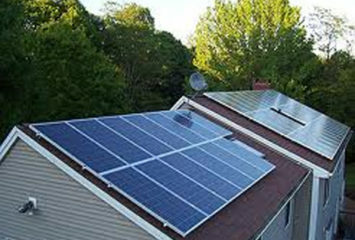 Easy Access: As solar power has become a popular energy option for homes, you can purchase a home solar kit online at a wholesaler, like Solar Electric Supply, or at your local hardware store, like Home Depot. If you choose to work with a professional installer, you may have to wait several weeks to get the equipment and schedule an installation date. If you install the array yourself, you can do so on your schedule when you want. Now, let’s look at the main cons of DIY solar installation. Complex Setup Process: While there are plenty of online tutorials for solar panel installations, you’ll still need to be familiar with construction and electrical work to properly install a home solar array. Beyond determining the size of your system and purchasing the equipment, you’ll need to carefully and correctly connect the panels and inverter, and then route wiring from the inverter to a battery or meter. If you aren’t comfortable working with electricity, there can be risks of fire or electric shock. Limited Application: Most solar kits are designed to be used off the grid, and utility companies often won’t let homeowners connect a solar array to the grid without the correct permits and sign-off from a professional. 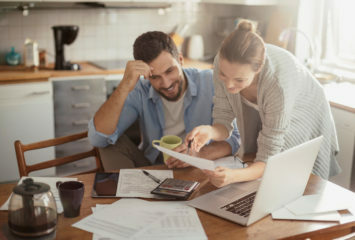 For the average homeowner who may still want to access electricity from their utility company, going off-grid can be problematic. If you do go off-grid, you’ll need to make sure your solar panels are producing enough electricity to meet your needs at all times. DIY solar installation can be a great option for those who want to power an area outside of their home, such as a barn, shed, or RV, as these units are already off the grid and don’t require as much energy as a home. DIY solar installation may also be the best option for those are already living off the grid and feel comfortable figuring out the process on their own. Hiring a professional company to install solar panels is a common option for several reasons. Here are just a couple of the pros of professional installation. More Experience: Some of the top solar companies have been installing home solar systems for years. You can feel more confident using a professional company since many states require installers to obtain licensure and maintain preset qualifications to install solar panels. Further, because most established companies have worked with thousands of customers, they can help you determine how much solar energy your home needs and which permits you must get before the install. Higher-Quality Materials and Warranties: While professional installation is more expensive than a DIY kit, you’re paying for higher quality in most cases—a big deal when you consider that quality solar panel systems can last several decades. Most often, solar installers can purchase equipment from distributors that don’t sell to the general public, meaning they have access to better-quality panels and supplies that a Home Depot kit can’t offer. Some solar companies even have proprietary panel technology that far outpaces market standards. Additionally, most professional installers provide warranties on their work, so any repairs needed in the future may be covered. While there are some significant pros, there are also a few cons of professional installation. More Paperwork and Red Tape: Before a professional installs your system, you’ll be required to undertake a lot of paperwork. The necessary permits and applications need to be filled out and filed correctly before work can start. And while the company will assist you with this process, it can extend the timeline, taking longer for you to get a system up and running. Additionally, if you are denied a permit or your utility company has stringent regulations regarding solar panels, you may be limited in your installer choices. Higher Upfront Costs. As mentioned earlier, professional solar installation costs generally run higher than the costs for DIY home solar kits. Many professional solar companies require payment up front, so you’ll need to either have cash readily available or apply for a solar loan. For many people, paying around $11,200 to $14,400 in cash isn’t feasible, and some may not want to apply for—or deal with the added interest from—a loan. While professional solar installation costs more, it makes the most sense for the average homeowner connecting to the grid. With warranties and quality materials, you won’t have to worry about fixing damages yourself, and you can feel more confident knowing your system is installed correctly and approved by your utility company. 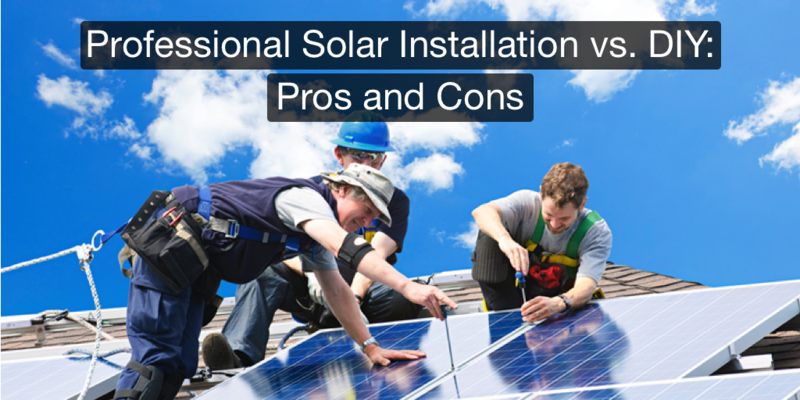 Now that you’ve reviewed the pros and cons of each installation option, you can better decide which makes the most sense for your situation. Next, research the company or brand of system that falls within your budget and energy needs.